One of the best things about Arlington is the fact that we’re home to the world-class UT-Arlington, an acclaimed research institution offering more than 180 graduate and undergraduate degrees in a broad range of disciplines - as well as a number of destinations that are well worth exploring for date night, family fun, or when you need a bit of quality time spent with yourself. One of Arlington’s “hidden gems” and top things to do at UTA is The Gallery at UTA, a 4,900 square-foot exhibition space offering free, year-round multi-media art shows, as well as lectures, symposiums and film screenings. All works exhibited are created or curated by UT Arlington students, faculty or selected guest artists, many of whom have Texas ties. It ain’t your mama’s lecture series, and it’s one of the most intellectually-stimulating events that Arlington has to offer. Mark your calendars today for the next round of presenters at the Maverick Speaker Series, a lineup of thought-provoking conversations led by innovators, icons and change makers, all of national and international renown. This year’s 10th anniversary lineup includes talks by actor Lou Diamond Phillips and astronaut Anousheh Ansari, while previous speakers have included the likes of Seth Meyers, Emmitt Smith, Bill Nye, Anderson Cooper, Soledad O’Brien, Daymond John, and Jane Goodall. 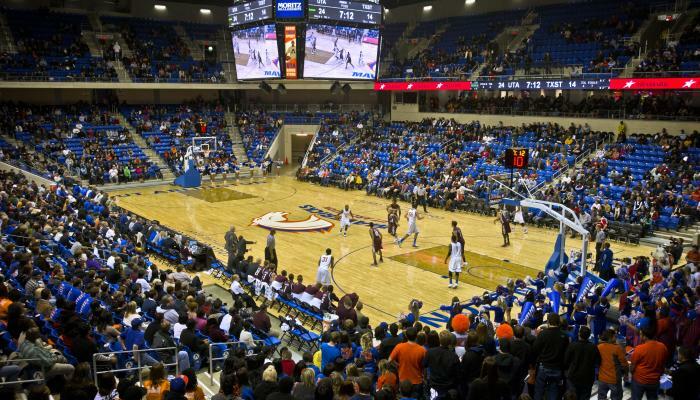 Presentations are held at UT-Arlington’s Texas Hall. TIP: Space is limited, so it’s recommended that you get tickets for your preferred speakers as soon as they become available. Given UT Arlington’s size and status, it’s not surprising that the university is a destination for an extensive lineup of year-round live and performing arts events - and in many cases, they’re available at a price that’s definitely budget-friendly. Visit utatickets.com often to find out what’s happening in the way of big events at College Park Center, performances by the UTA Jazz Orchestra, university live theatre, and more. COMING SOON to College Park: WWE Live and a Christmas concert from Casting Crowns. Are you crazy about college sports action? Head to College Park Center, Maverick Stadium, Clay Gould Ballpark and other campus venues to catch the UTA Mavericks playing championship-level baseball, volleyball, track and more. But don’t wear yourself out completely, because you’ll want to save some energy to cheer on the mighty Dallas Wings at College Park Center when the WNBA season kicks off each spring. Note: The ladies of the Wings are in the Playoffs! Visit wings.nba.com for a playoff schedule, or click here view the UTA athletic schedule. This beautiful “urban oasis”, which was designed to include a number of impressive environmentally-sustainable features, is a wonderful destination for strolling and communing with nature while simultaneously feeling the beat of the heart of the city. Located along the Center Street Pedestrian Trail, The Green at College Park features an expansive lawn, a curved wall with seating, native grasses and adaptive plants, plus easy on-foot access to other parts of the campus. Pack up a brown bag lunch, grab a book and enjoy a quiet hour or two outdoors.